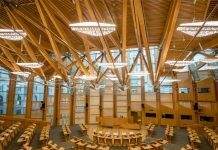 It’s not often that a newly opened building normally associated with dusty, quiet rooms and bland architecture attracts so much interest in the international press. 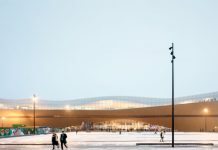 Both architectural and popular media have drooled over the extraordinary design of the Tianjin Binhai Library in China by Dutch architects MVRDV and local designers Tianjin Urban Planning and Design Institute (TUPDI). The 33,700sqm cultural hub, part of a larger masterplan to provide a cultural district for the city, features a luminous spherical auditorium and floor-to-ceiling cascading bookcases not only as an education centre, but also social space and connector from the park into the cultural district. 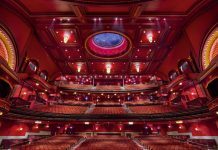 An oval opening punctured through the building is propped open by the Eye, a luminous sphere with an auditorium, which takes the main stage within the atrium and enlarges the perceived space within. The building is lifted upwards creating cascading floor to ceiling bookshelves that also act as seating and walkways leading to more private reading rooms. Terraced bookshelves echo the form of the sphere to create an interior, topographical, landscape whose contours reach out and wrap around the façade. In this way, the stepped bookshelves within are represented on the outside, with each level doubling up as a louvre. The library’s open glass façade opens to the park outside so it is a light, airy and welcoming space. MVRDV made proposals for the lighting design during the design phase but eventually this task fell to TUPDI who designed the lighting for the atrium and then assigned Tianjin Architecture Design Institute (TADI) for all other areas with lighting designer Huayi Jianyuan leading the project for TADI. 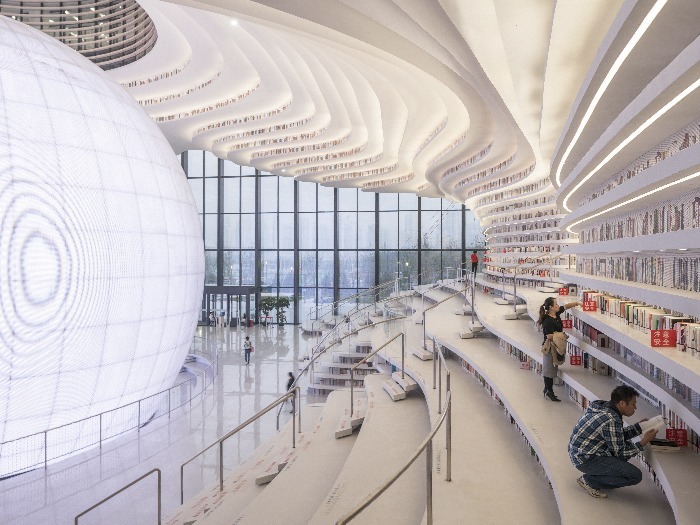 The terraced bookshelves and ceiling relief are highlighted by natural white flexible cove lighting (provided by Osram 4000k Value Flex G2) that echoes the form of the sphere creating a luminous topographical landscape whose contours reach out and wrap around the façade. In this way, the stepped bookshelves within are represented on the outside, with each level doubling up as a louvre. By contrast, the Eye is illuminated in cool white emphasising this remarkable structure within the building. The futuristic library sits within a sheltered gallery, topped with cathedral-like vaulted arches, which winds its way throughout the scheme. MVRDV’s project is surrounded by four other cultural buildings designed by an international team of architects including Bernard Tschumi Architects and Bing Thom Architects. The five-level building also contains extensive educational facilities, arrayed along the edges of the interior and accessible through the main atrium space. The public program is supported by subterranean service spaces, book storage, and a large archive. From the ground floor, visitors can easily access reading areas for children and the elderly, the auditorium, the main entrance, terraced access to the floors above and connected to the cultural complex. The first and second floors consist primarily of reading rooms, books and lounge areas whilst the upper floors also include meeting rooms, offices, computer and audio rooms and two rooftop patios. Tianjin Library is part of German architects GMP’s 120,000sqm masterplan which aims to accentuate the characteristics of the surrounding districts. Through its design, the complex will become a junction point for the Central Business District, old town, residential districts, commercial areas and the government quarter; hoping to compensate for any missing programme in each. The library’s outer volume was given in the masterplan so the Eye and its surrounding semi-public area are an internal space, like an inverted icon, acting as a central point and folly in the building. The library is MVRDV’s most rapid fast-track project to date. It took just three years from the first sketch to the opening. Due to the given completion date site excavation immediately followed the design phase. The tight construction schedule forced one essential part of the concept to be dropped: access to the upper bookshelves from rooms placed behind the atrium. This change was made locally and against MVRDV’s advice and rendered access to the upper shelves currently impossible. The full vision for the library may be realised in the future, but until then perforated aluminium plates printed to represent books on the upper shelves. In the Kindle era, the difficulty of getting people to visit libraries to interact with books is obvious. However, since its opening in October 2017, visitor figures have gone through (or should that be, undulating through) the roof. MVRDV has created an iconic piece of architecture that will live long in the memory for as long as books are still enjoyed.